After 5 long months of leisure-watching, I've finished re-watching the whole of the ARIA series! Here are the messages I've picked out of ARIA the Origination. I omitted quite a few as some of them felt too idealistic or utopic. It’s important to constantly think you always have some way to go in personal development because once you’re satisfied with your abilities, you won’t be able to move forward any further. You should accept your imperfect self and have fun with life! One shouldn’t be too hard and inflexible as it will prevent learning and improvement. You should be flexible instead and willing to transform yourself. Even the greatest of people have their own insecure side. Memories are treasures which you keep in a treasure chest. A pure friendship should not have any prerequisites in order to meet and confide. Change can be tough but one can look forward to the new positive experiences that await. Here is the episode ratings which I'd personally give. Because I'm a newb at Excel, Ep5.5 is labeled as 6, ep 6 = 7 and so on up until 13 = 14. 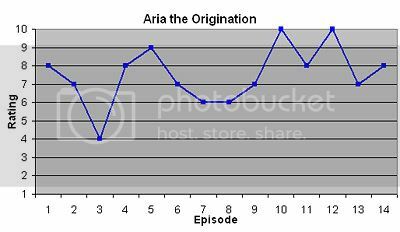 At a mean of 7.50, it scores the highest out of all three ARIA series in my head. 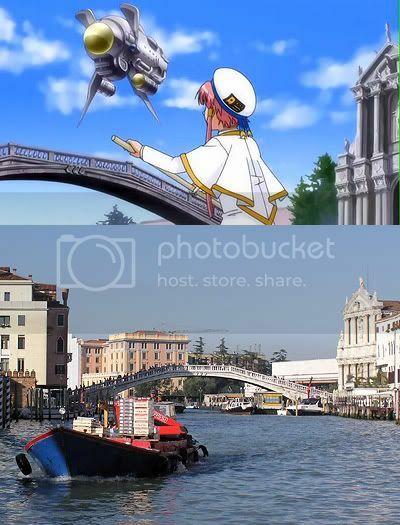 The final episodes of ARIA the Origination also provided me with some picture matching opportunities! In the real-life Venice, the wells were covered with sturdy metal lids, not the rotten wood Aika managed to jump onto! 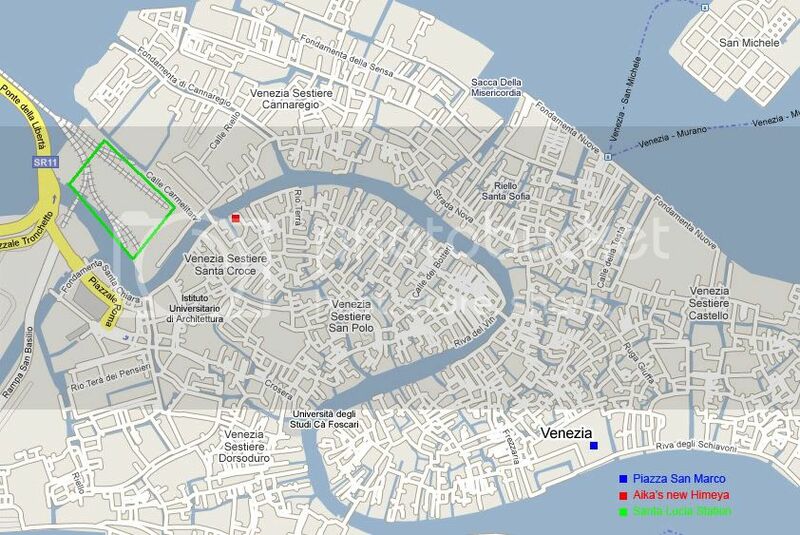 So far in ARIA, we had only seen 2 of the 3 (functioning) bridges across the Grand Canal. In Ep11 of The Origination, we finally see the last one - the Scalzi Bridge, complete with the Scalzi Church! While I got a negative match from google maps satellite, I could still pinpoint the exact location of where the producers threw in the new Himeya branch. Hmmm, you really rated Aria pretty low... even if wouldn't be a fanboy, I couldn't rate it below 9. Maybe, because you're not that really idealistic... anyway, good post. Ep1 had a really useful message for me, and I still live according to that. 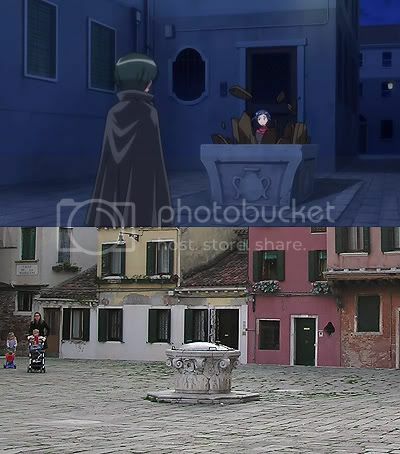 I really like the way you've combined the pictures with real photos of actual location - must have taken you a long time to map it out prior to heading to Venice! I see ARIA as a "love it or hate it" thing. I've watched one of the best episodes with a non-enthusiast and it actually felt boring O_o... I'm also slowly realising episode averages are a different thing to overall ratings - I've given it a 10 at MAL. Not really and to be honest, most of the matches are major landmarks. It doesn't look quite the same as the Himeya branch, but it's near enough as to make no difference. I have to admit, though, the episode itself didn't make me feel like it's fronting on the Grand Canal. I realise it's been almost a year but really appreciate your input! So it looks like they stuck the fictional Himeya building between two real buildings. The Rose garden episode seems to be The Natural Ep9 (Thanks, Wikipedia!). The exterior looks pretty generic but your photo does prove such rare, open gardens truly exist in the middle of Venice. 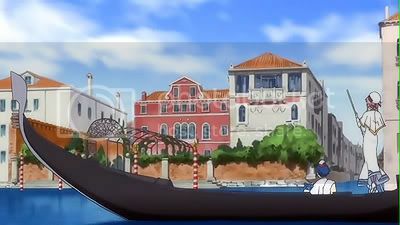 Thank you very much for sharing, it cleared up the new Himeya and gave an insight into a side of Venice (open spaces) that one would normally not pay any attention to. Actually, I'm fairly sure the Himeya building is there, though possibly not quite as large and grand as shown in the anime - it's just hidden behind the white building on the corner. Sadly, I couldn't quite reach a point directly in front of it - I took this from the opposite bank, and most of the Grand Canal doesn't have canal-side paths.